Hint: It's a total love fest! THANK YOU! I went to New Orleans for Mardi Gras and experienced your Caramel Popcorn for the first time and have been addicted since. I've got everyone in the family addicted as well. Hello! I'm so happy to hear my order has shipped! We are frequent visitors to New Orleans – we love your city and we love your CheeWees! We're not able to find them in Pennsylvania and we had a craving so we decided to bring a little taste of NOLA to us! Have a great day! I'm a New Orleans native, but have relocated to Ann Arbor, Michigan. I've loved my Elmer's CheeWees since I was a kid, going to Schwegmann's with my Daddy to buy them. My kids are hooked on them too and were upset that I couldn't come home for my birthday and Mardi Gras to buy more of our favorites. The only thing I can say is----THANK YOU so much for bringing back good childhood memories with my CheeWees! It's been a hectic week here but I nevertheless wanted to reply to your email and thank you. It was very nice of you to take time out of your schedule to update me on my order status, it also made me feel special that the owner would do as such. Baby, my family and I are N'awlins natives, who bleed Black & Gold (Who Dat! )...and yes we were robbed! I personally have been eating Elmer's snacks since my elementary school days at Edision, through junior high at Colton and Kennedy Senior High. Whenever we would come home for visits we would stock up one CheeWees at the gas stations or grocery stores and take them back to Texas until I started purchasing from your site the past 4-5 years. 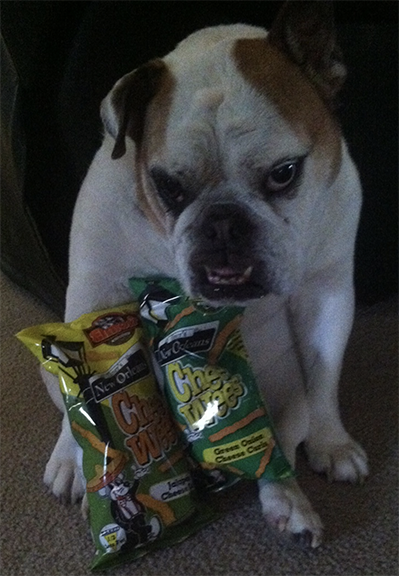 Again it was nice to hear from Elmer's top brass, my package has arrived and we are enjoying CheeWees as I type. You have a long-time customer here that will continue to support a New Orleans original. Have yourself a fantastic weekend. Thank you very much! I am originally from Farmersville, LA and I was raised on CheeWees. Thank God you can purchase them online. Thank you again! I grew up in the Panama Canal Zone in the 50s & 60s where CheeWees were an essential snack for all of us. They were packaged in a can back then. I was surprised...and happy to find them again while in Metairie, LA visiting a cousin earlier this year. I made sure to stock up for our trip back to Houston! As good as ever, and waaayyyy better than the "other" brand. Thanks for bringing back childhood memories. Hi guys! I'm a native of Denham Springs, Louisiana and I live close to Houston, Texas now. I had driven home for a friend's memorial service this past weekend and stopped in Lafayette for snacks.I saw your product display and grabbed a bag of the "Hot-N-Spicy" CheeWees—and fell in LOVE! Do you guys have these anywhere close to me (NE Houston) so I can get more???? Hi! My fianc̩e is from New Orleans and we bought some of these when we were on our trip and I LOVED the BBQ CheeWees and had to have more! We have found them in a store near our home and I thought it would be nice to order some for the house. Thank you and I really love this flavor! My wife is from Clinton, LA and I came to Baton Rouge this weekend for a funeral—while staying with family I was introduced to the wonderful flavor and flair of Elmer's CheeWees. I LOVE THEM! In fact, I loved them so much that I have ordered a case to ship to my home in Florida. You've got a fan for life! We will enjoy every crunchy bite! I'm from Metairie but live on the west coast. My 10 year old got hooked on the green onion flavor on a trip back home. Still not the same without a roast beef poboy to eat with them. Haha THANKS AGAIN! Thank you for reaching out! I see that you're part of the Elmer family. I just wanted to say that whenever I was a child and my family would visit my grandmother in Metairie, the first thing we would do on our way to her house on North Bengal would be to stop at a Winn-Dixie and pick up some CheeWees. I recently went on vacation with my family to Grand Isle, and I was so happy to see CheeWees on the shelf of a grocery store on the way there. It's a fun part of my childhood, and I brought some bags to share with my coworkers all the way out here in Seattle - they all loved them! I had to buy some more, and the offer on your website is a great deal. I can't wait to share more of your products with my friends here (and for myself too!). Thanks again for reaching out, and for your family's work continuing to be a cherished part of the authentic New Orleans experience. My wife, myself and our bulldog, Ella (below), LOVE your snacks! Hi,I just wanted to leave a little feedback. I grew up on Elmers snacks, growing up in Mandeville. The last 8 years or so I've lived in North MS, where at age 23 I have been without Elmers snacks for the important years of my life haha. It just recently clicked in my head and I placed an order for a case of the green onion chee-wees. It arrived in no time via UPS, and I was very pleased with the quality I could always remember from when I was a kid. My family loved having the old tradition around the house, and I even got my fianc̩ and her family (north MS natives) hooked on them! They really liked the caramel popcorn and the original cheddar chee-wee bonus bags that were thrown in. You will definitely continue to get my business now that I know I can get them sent to my door! Thank you for your years of service, and I hope you all have a wonderful week!